Nearby, the twin lakes of Llyn Padarn and Llyn Peris cut through the mountain range creating the Llanberis Pass, in an area noted for its rugged beauty and scarred with numerous slate mines. Scores of visitors meet in Llanberis; it is truly an impressive place steeped in history yet still retaining an air of tranquillity. Travel on Britain’s only rack and pinion railway to Hafod Eryri, the stunning new visitor centre at the Summit of Snowdon. Since 1896 people, regardless of age or fitness, have claimed the peak of Snowdon as one of their lifetime achievements. The Llanberis lake railway runs along the northerly shore of Llyn Padarn with the main station located in the Padarn Country Park, across the valley from the town of amidst unspoilt woodland and a range of tourist attractions related to the slate industry. The journey can be broken at Cei Llydan to capture the spectacular views. 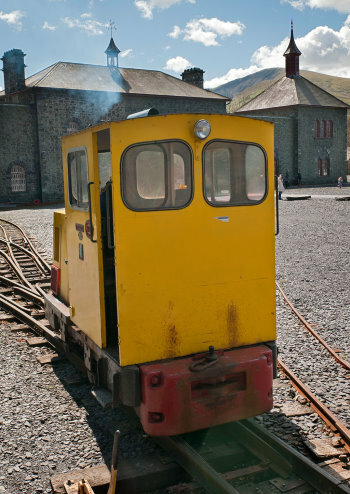 The tiny locomotives used on the line have all seen service in Dinorwig Quarries at one time or another where they once hauled slate wagons in the quarry. A modern industrial wonders of Wales, if not the World. This massive hydroelectric power station is built inside the mountain amidst miles of tunnels carrying roads and water. The main turbine and generator chamber is said to be the largest underground chamber ever excavated by man. A bus tour of the power station starts from the 'Dragon in the Mountain' exhibition in Llanberis. Commercial Quarrying began at Dinorwig in the early 19th century. Railways worked by dozens of small steam locomotives transport the slate from Dinorwig to the sea at a harbour known as Port Dinorwic. The quarry closed in 1969 and is now a major tourist attraction. The railway and the other exhibits of Padarn Country Park such as the National Slate Museum ensure the 3000 men who once worked the quarries are remembered as do the quarry workings which have laid open the side of the Elidir mountain nearby. The Welsh Slate Museum holds one of the largest water wheels built by Victorian industrialists. The De Winton company of Caernarfon built the 15.4 metre diameter wheel, in 1870. Water to power the wheel was piped down from the slopes of Snowdon in cast iron pipes and its power drove the machinery to produce slates for roof all over Industrial Britain. It remained in operation until 1925, when a smaller, more efficient model substituted it. Such is progress! Situated 3 miles up the glacial valley along the river Seiont, towards the magnificent Llanberis Pass, is the little village of Nant Peris home to an ancient church and famous well much visited by 19th century invalids, who would watch the two "sacred fish" in the well. If the fish appeared as they took the water, a cure was certain! 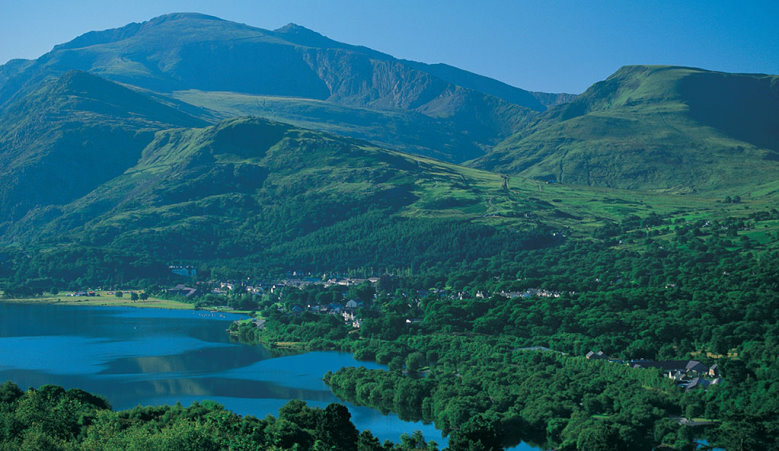 The Snowdon Race: Held in July every year, this internationally famous race starts and finishes in Llanberis. the competitors race to the summit of Snowdon, five miles away and 3560 feet high. The Snowdonia Marathon: A gruelling marathon that starts and finishes in Llanberis, circumnavigating the Snowdon massif. It passes Pen y Pass: 1100 feet above sea level! Held in October. The Carnival: The carnival is held in Llanberis every July, and provides fun for children from one to a hundred and one. The carnival parade passes in front of all the hotels on the high street. Just 8 miles from Llanberis is the magnificent Caernarfon Castle and town walls. 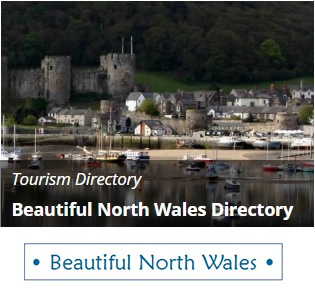 Visit also Betws-y-Coed (17 miles from Llanberis) and Beddgelert (15 miles from Llanberis).